You are currently browsing the Bookmobile News weblog archives for November, 2015. 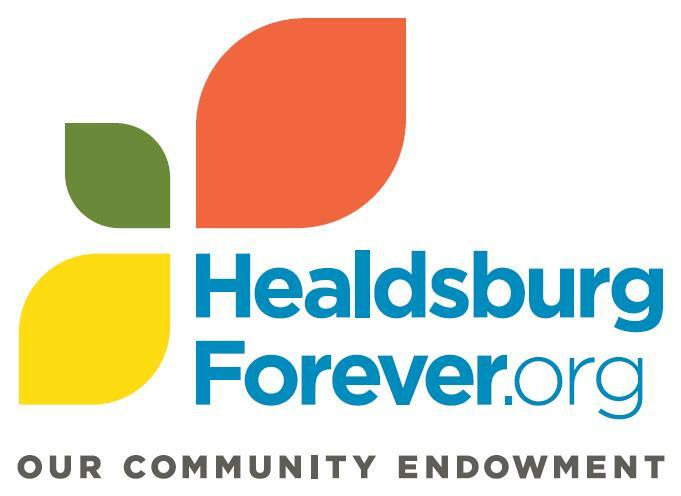 We are thrilled to continue our partnership with Healdsburg Forever.org to bring terrific books to young and old alike throughout Healdsburg and Geyserville! This dedicated group was formerly known as the Community Foundation Healdsburg Area Fund and hopes that their new name will help “simplify how they are found in the digital world, seen and understood”. They are still very much affiliated with that stalwart of local non-profit support, Community Foundation Sonoma County. Healdsburg Forever.org are passionate about leveraging their fund to bring valuable services directly to the residents of the region. 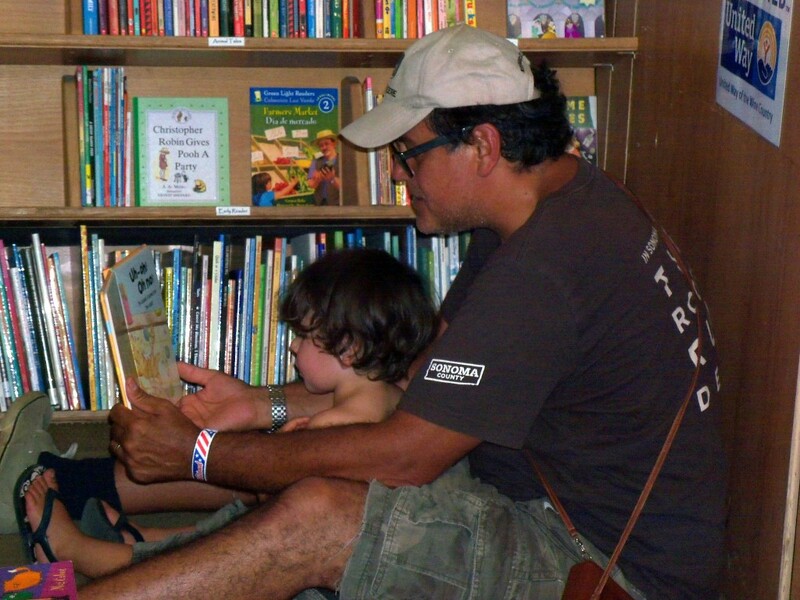 This 5th-straight-year grant for the Free Bookmobile makes a powerful statement about their belief in literacy outreach, as well as in the need to support small organizations with operational funding. We are grateful to both this hard-working board of directors and the many donors who have brought the Healdsburg Forever.org endowment up to over $1 million in a relatively short time. For more information please click the logo — 100% of donations go directly to the non-profits. “I am glad that books arrived and hope some children will enjoy reading them. Books you brought will be read by my english class students as a self study. I am always happy when native english speakers give opportunity for my students to speak face to face with them. I think this book exchange will bring cultural awareness to children. Thanks for everything again. 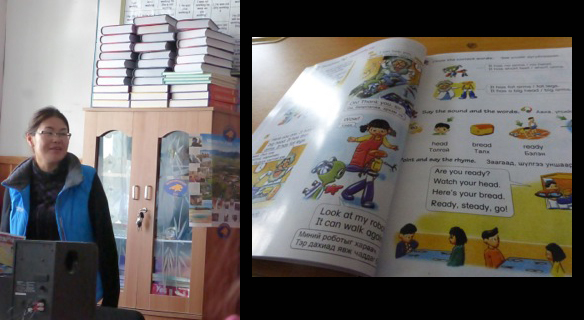 The photos below show the books we sent and then later received, teacher Nergui Enebish and one of her bilingual books, as well as Sharon’s group of Americans in the classroom with local students. Big thanks to Sharon and Nergui for making this exchange possible! We welcome the opportunity to participate in additional book trades in the future. Feel free to be in touch if you are travelling to an unusual foreign land! 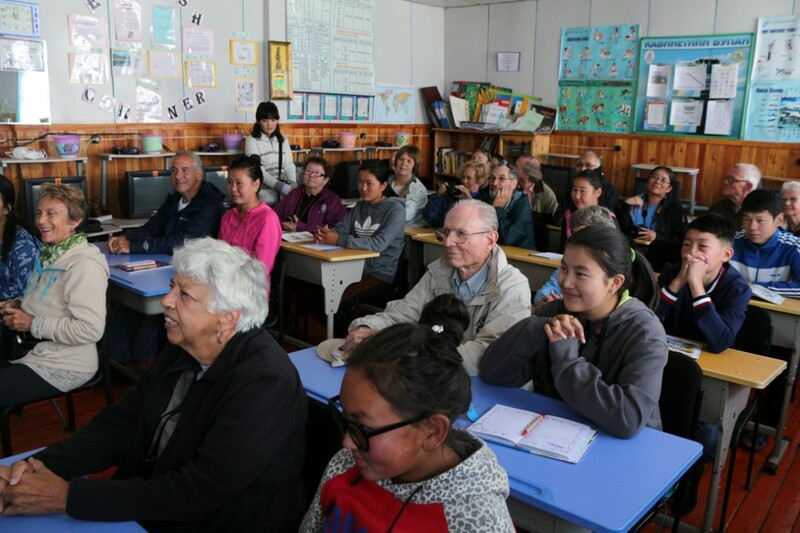 American visitors sit with Mongolian students in Khargal. Our parent organization, the Sonoma County Public Library Foundation, put together a festive multicultural celebration on October 18 to raise awareness and money for the much anticipated new Roseland library branch by the Dollar Tree on Sebastopol Road. There were a host of fun activities, refreshments, mechanical bull rides…and of course fabulous free books from the bookmobile! Due to open in early November, this temporary branch will share space with the local Boys & Girls Club, so library hours will be limited to mornings and Saturdays for the time being. The plan is to eventually raise enough funding to build a permanent structure in a nearby lot that will operate like the other official county branches. It is a desperately needed resource due to the high population density and lower incomes of the area. The plan drawings suggest a beautiful park-like campus with other modern facilities nearby. Thanks to our outreach, local residents already know this is the spot for literacy and love of reading — the Free Bookmobile has been providing regular service to the neighborhood for the past seven years!